We here at Children of The Blazing Fist are big fans of stories about characters that live in a world of pure good and pure evil but decided to choose neither out of pure spite (that needs to be a sub-genre or something). Chronicles of Wormwood is such a story. 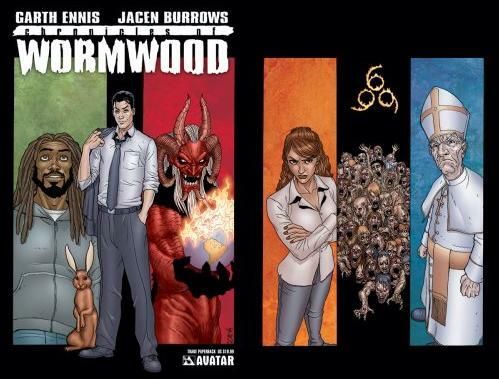 Chronicles of Wormwood was a six-issue miniseries that was released between 2006 through 2007. It was created and written by Garth Ennis, with art by Jacen Burrows. The story centers on Danny Wormwood, son of Satan (a Satan I might add who plays a Champagne villain with goat horns) who lives out his life as the Antichrist. He spends his days in New York working as the Cable TV executive of Wormwood production, living with his longtime girlfriend Maggie and a talking rabbit named Jimmy (by the way Wormwood can change something permanently once a day). We find out that he was born in London through his mother being raped by Satan, then raised by wealthy foster parents that would die gruesome deaths one after the other. The inheritance they left him, allowed him to move to New York and obtain the life he has now. After working all day, he goes to his favorite bar to spend some time with his best friend Jay (who you might know as Jesus Christ). This leads up to the real meat of the story. Danny and Jay are both sons who did not want to follow their father’s orders. Danny does not want to bring on Armageddon, opting out to wait and see how the humans fare. While Jay, who after being brought back to Earth to fulfill his own destiny, went on his own journey to fight for human happiness. Unfortunately, peace fighting in the modern world would only warrant a caved in skull from a cob’s baton. Jay hereafter was left in a two-year coma that left him with memory lose and mild retardation. When something important blows up in Wormwood’s face (I will not spoil it), the world of the living does not feel as fine as it should be. So Jay suggests that he, Wormwood, and Jimmy have a spiritual road trip; one that will take them to both Heaven and Hell. But unbeknown to them, the Vatican’s eyes are always watching Wormwood; reporting to the latest Australian Pope (who likes to go by Pope Jacko) who is as cunning as he is perverted. I do not have the cache of Punisher and Preacher love that other Garth Ennis fans have, but I do appreciate his work for Avatar Press. Heck, the entire reason I picked up Wormwood in the first place came from my discovery of the first Crossed series. He has a way of making premises that allow for the vile nature of humans to really shine through; but, does so while still remembering to keep the characters likable. (This is a man who wrote a scene where the main characters are being numbed by the grievous tortures going on in Hell; only to later show the Antichrist comforting Jesus, who is very affected by what he is witnessing.) This might sound a little cheesy but, I believe you can succeed as a writer if you can mix crass and vulgarity with friendship and compassion. Jacen Burrows’ name on something will get me excited. I honestly do believe that his character’s faces tend to be off the mark at times, (that is the only bad thing I can say about his art.) Continuing with the topic of his faces, they follow what I consider to be the Jacen Burrows style of clay people with hyper detailed features. This is more predominant with his male characters, but everyone has these chiseled faces; each line adding to the powerful expressions that I have come to know from Burrows. Burrows draws fantastic depictions of Hell’s atrocities (which many were used as issue covers.) He even leaves these little touches to the panels themselves. When they go to Heaven, the panels get smoothed down and the panel bars turn Baby Blue; and when they travel to Hell, the panels turn jagged and at times even laid out sporadically, while the panel bars turn Crimson. Pros: Chronicles of Wormwood has this air about it that feels like it is attacking people’s beliefs, but in fact it goes out of its way to illustrate the importance of these beliefs. Heaven in Chronicles of Wormwood accepts all types of people no matter the religion, as long as they follow a simple thing that Jay likes to put it as “First do no harm”. I thought that this concept had heart. Biblical characters besides the Antichrist and Jesus make interesting appearances, with many of them casually interacting with the main cast (for instance, the Whore of Babylon who just shows up for drinks and to warn Wormwood about the Seven Headed Beast). 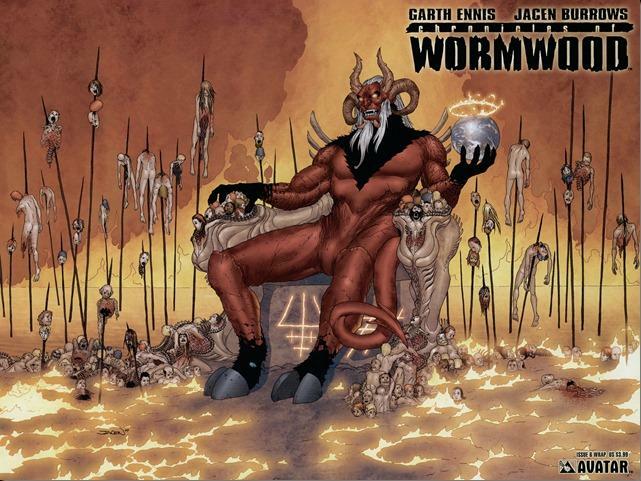 It really showcases Jacen Burrows’ talent. Conveys wit and biting snark, but not without its passion. Cons: Introduces cool concepts then passes them by at a break neck speed. 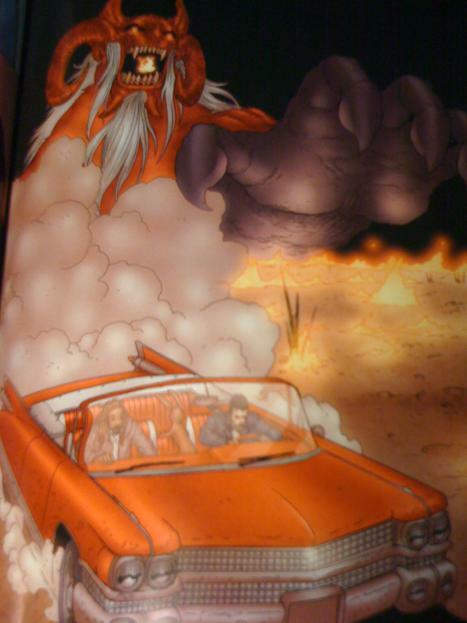 That Afterlife road trip is only one and a half chapters, and it left many things not flushed out. A large amount of exposition at times bogs things down. The ending is a little rushed, dare I say with the power of Deus Ex Machina. Almost like watching the first ten minutes of a movie, the middle thirty, and the last fifteen. If you just found yourself with the Avatar Press catalog and after you tore your eyes away from the Lady Death covers, I suggest you try checking out the first Crossed series. Then, when you have already been initiated into the minds of these two geniuses, you should check out Chronicles of Wormwood. Think of it as “Messed-up Comics 202” (subtitle: Talking about Religion). This first trade is a lovely gloss covered tomb of madness that would look lovely next to that lonely Bone The Complete Cartoon Epic In One Volume edition on your shelf.